At the present time there are two schools of thought in this country. Some ornithologists maintain that the eel is undoubtedly the [shag’s] chief form of food, and while they admit that a few trout are taken also, they insist that this harm is more than counterbalanced by the harm done to the trout’s enemy – the eel. On the other hand, Anglers’ and Acclimatisation Societies, who have to bear the trouble and expense of stocking the rivers, maintain that the Black Shag constitutes a menace, to our trout streams and that their destructive powers far overreach any benefits that may be accrued by eel elimination. There was only one way in which to settle the question. I shot a number of Black Shags. They all contained trout! I shot many more. Still more trout and still no eels. I then prepared forms and sent them throughout the country. That was a quarter of a century ago. Since then I have received nearly 3,000 replies. 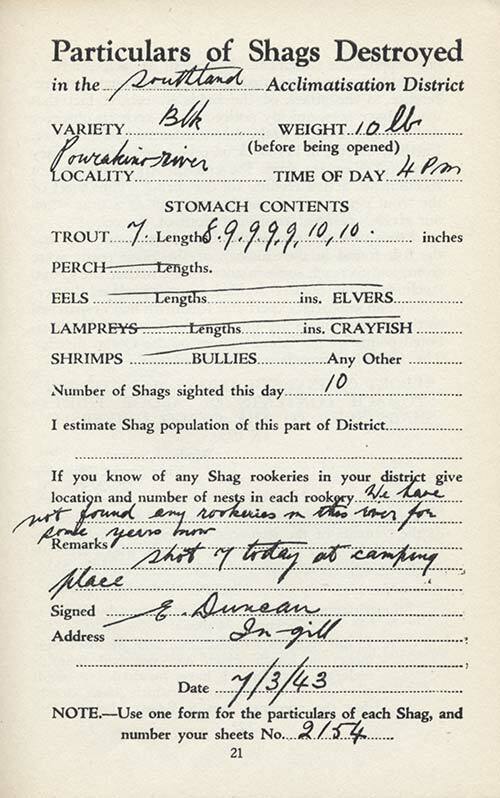 In a total of 2,883 stomachs examined there were only 18 eels, while there were 15,805 trout; an average of 5½ trout in the stomach of each Shag. There is no room for doubt as to what constitutes the Black Shag’s diet. … Traps, snares and poison have been tried, with little or no success. … The only alternative, then, seems to be that of wholesale shooting, which can be best done at the rookeries in the breeding or nesting season. My suggestion is that a South Island Shag Menace Control Board be set up…The fishing licences could be increased to 30/-, one-sixth of which could be allocated to Shag destruction. – Abridged from H. G. Williams, The shag menace. Tīmaru: Herald Print, 2002 (original published 1945), pp. 13, 14, 48, 49. From 1870, when trout were introduced, this bird has been persecuted by every Acclimatisation Society in the country. I am a keen angler myself, deriving as much enjoyment as anyone from pitting my wits against those of an artful trout, but that does not cause me to wish for the destruction of all the Black Shags in the country, but rather to regard them as brother anglers, whose need of fish is, indeed, much greater than mine. Most of the Societies put a price on the bird’s head, the sum varying from one to five shillings in different districts, and prominent members of them take great pride in destroying breeding colonies of Shags, in many cases where the nests are inaccessible, leaving the bereft young to die of starvation. Quite apart from the question of whether the Shag does damage to the trout fishing, the crude method of putting a price on the birds has resulted in all species of Shags being persecuted. There are, no doubt, certain streams where Shags do affect the angling adversely, but it is difficult to believe that no better plan for their destruction on such waters can be devised than the clumsy expedient of putting a price on their heads throughout the country. Up to 1911 half a crown had been paid for Black Shags’ heads by the North Canterbury Acclimatisation Society, and their numbers had been greatly reduced throughout the district, particularly at Lake Ellesmere. At this time the angling in the Selwyn River, the principal tributary of the lake, was poor. In 1911 the Society ceased paying for Shags’ heads, and for fifteen years did not do so, and in that time there was a great increase in the number of Shags on the lake, and an equally marked improvement in the angling of the streams running into it. – From Edgar Stead, The life histories of New Zealand birds. London: Search, 1932, pp. 1–2.